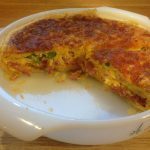 DemeterG.com | All things food, cooking & recipes and then anything else…. All things food, cooking & recipes and then anything else…. I have started getting a vege box each Friday from Backyard Bounty and recently had a heap of apples, plums and strawberries and a bucket of plums from my parents. 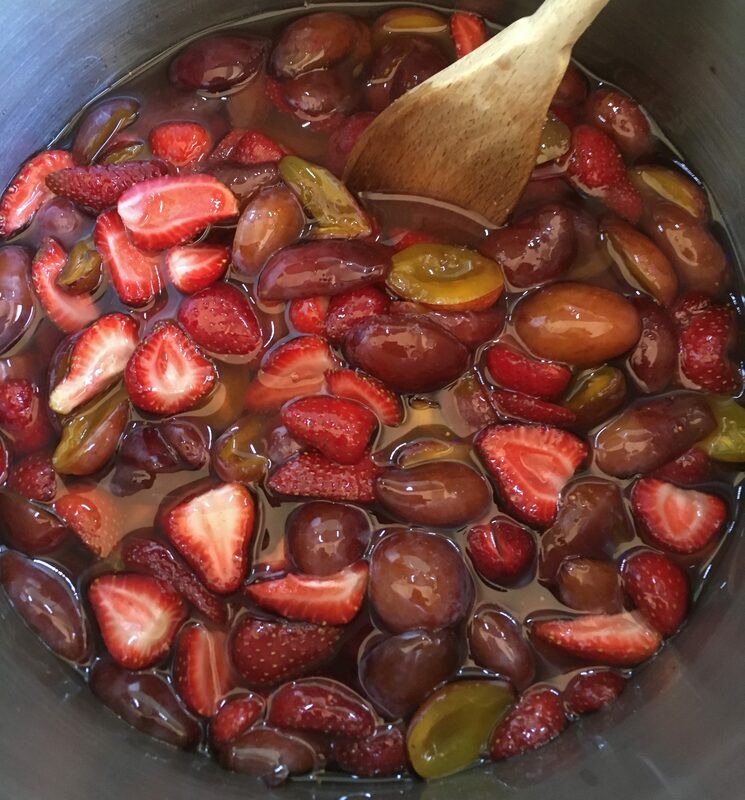 I turned it all into Apple and Sage jelly, Chinese Plum sauce, Strawberry BBQ sauce and Plum and Strawberry jam. 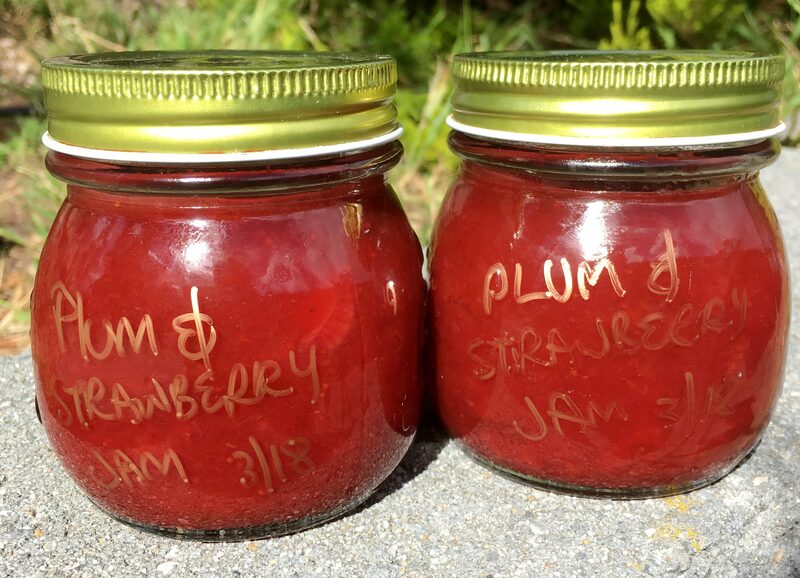 This plum and strawberry jam was form a Strawberry Plumcot (or Pluot) Jam recipe I found in the Blue Chair Jam Cookbook. Drizzle over 65 g of lemon juice. Cover tightly and refrigerate for 24 – 48 hours, until the fruit has released its juices. When ready, stir well to help dissolve the sugar and add 65 g lemon juice. Taste the liquid of the mixture and slowly add more lemon juice until you just taste the lemon juice. Transfer to a large pot and bring to a boil over a high heat, stirring frequently for four minutes. Remove from the heat and skim. Return to the heat and boil until thickened, approx 20-30 mins. Reduce heat if it starts to splutter violently or stick. Stir regularly as it will burn easily. Stir constantly from now on and bring to 104.5°C. Take off the heat, skim any remaining foam and if desired, sprinkle over rose water. This is a favourite in our house. DB suggested he’d like a blue cheese sauce next time. I think that would work nicely as well. 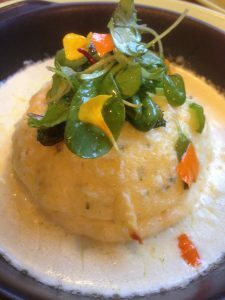 The wonderful thing about this recipe is you can freeze the souffle’s and have a little stock handy when you need to impress or just can’t be bothered. Refrigerate four 180ml capacity soufflé moulds. Boil a large saucepan of water. Melt butter in a small saucepan, remove from heat and lightly brush chilled moulds with butter, refrigerate moulds again until ready to fill. Return the remaining butter in pan to low heat, stir in flour and cook for 2 minutes. Gradually pour in the warm milk, stirring continuously until mixture boils and thickens. Remove from heat; add cheeses, parley, and chives, season to taste with sea salt a freshly ground black pepper, then stir until well combined. Whisk in egg yolks, one at a time, then transfer mixture to a deep bowl. Using a electric mixer, whisk egg whites with a pinch of salt until stiff peaks form, gently fold 1/3 the egg whites into the warm cheese mixture to loosen, then fold in remaining egg whites until just combined. Divide soufflé mixture among moulds, then place in a roasting pan, pour in enough boiling water to come two-thirds of the way up sides of moulds and bake at 180°C for 16 mins or until risen and firm. Remove soufflés from water bath and cool for 5 minutes: Soufflés will deflate. 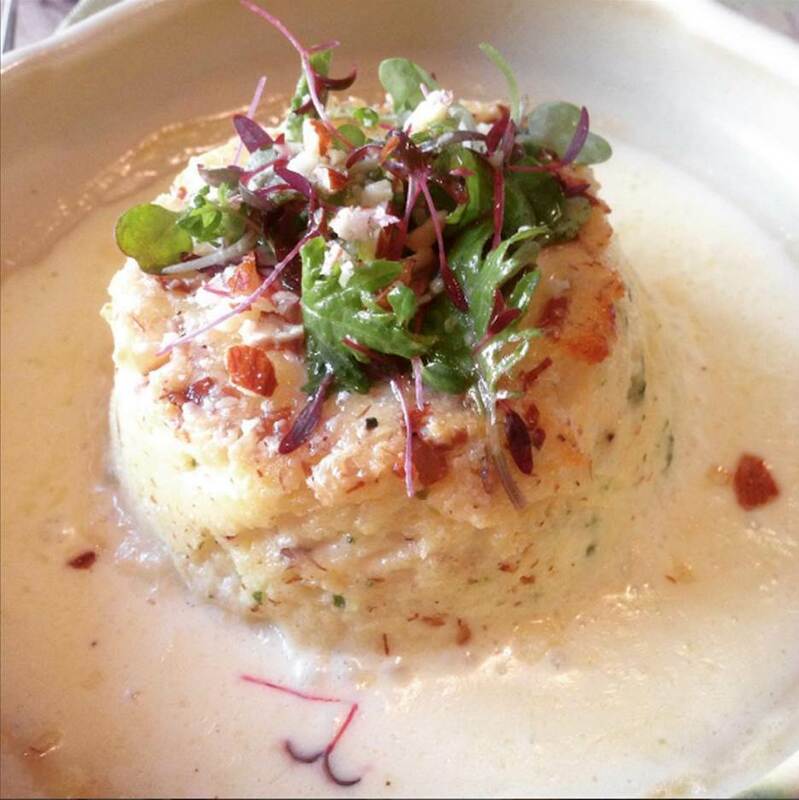 Using a small knife, carefully ease soufflés out of moulds and place each in a 20cm gratin dish. Soufflés can be frozen for later use at this stage. Heat olive oil in a saucepan, add garlic and cook over low-medium heat for 1-2 minutes or until fragrant, but no colour. Add cream and cheeses and bring to the boil. Remove from heat, season to taste. Spoon 1-2 teaspoon of water around each soufflé and bake at 180°C for 8-10 minutes or until the outside of the soufflé starts to colour. Pour a quarter of the sauce over each soufflé and bake for another 2-3 minutes or until the soufflé starts to puff out and sauce starts to colour around the edges of the gratin dish. Remove the souffles Top soufflés from the oven and top with a dressed micro salad if desired. I started making this for my SIL, who tries to go gluten and dairy free where she can. 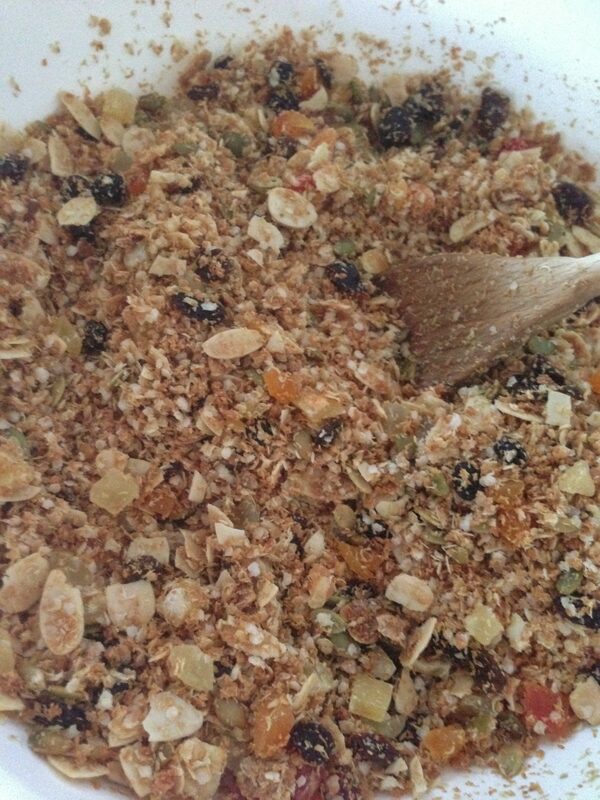 Although the quinoa flakes smell awful while the granola is cooking, it tastes great. If you don’t care about gluten free you can substitute rolled oats and if you don’t like the coconut oil, you can use butter or a neutral veg oil or nut oil. Add the quinoa flakes, coconut, almonds & pepitas together. 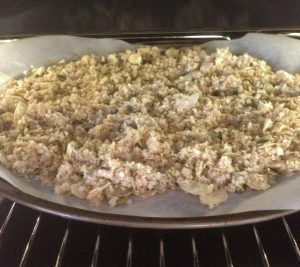 Spread the mix onto trays lined with baking paper and bake at 150°C, stirring every 10 – 15 minutes or so, until the mixture is toasted to your liking. Serve with your favourite fruit and yoghurt for breakfast. This is a wonderfully simple, rustic dish but so also tasty. 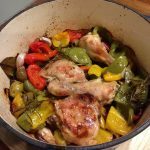 It is my go to – one pot dish, when I can’t really be bothered cooking. It comes from the book Limoncello and Linenwater by Tessa Kiros. Serve it with a nice fresh ciabatta or sourdough. We like to squeeze the cooked garlic cloves and spread on the bread and then pile on the “peppers” and olives on top, and then to soak up the chickeney olive oil. De-seed the capsicum and slice into pieces about two to three cm square and add to a heavy based casserole that has a lid. Add the remaining ingredients, season generously with salt & pepper and toss to cover everything with oil. Put on the lid and cook for 1½ hours. 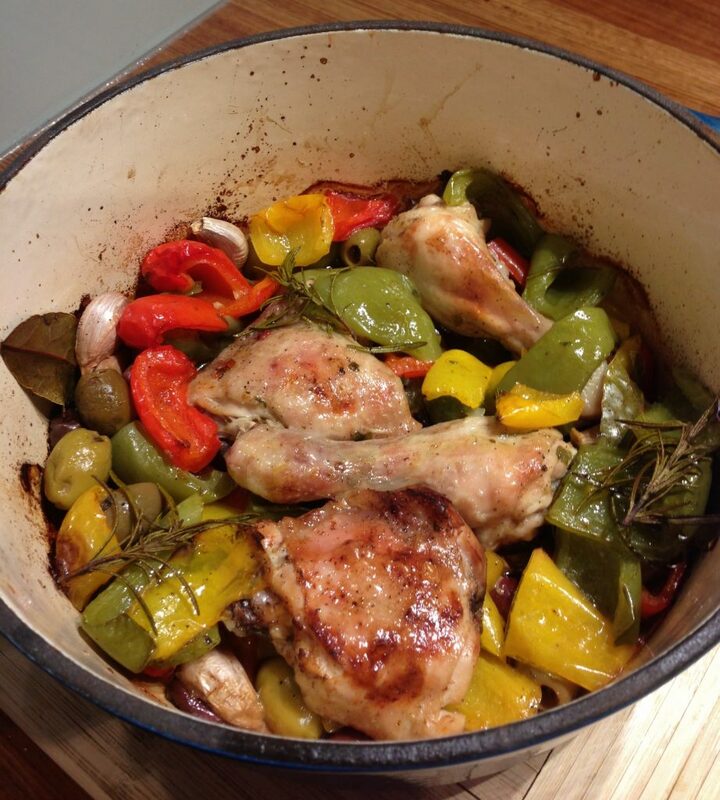 The chicken should be cooked through (85°C or higher in the center) and the capsicum nice and soft. 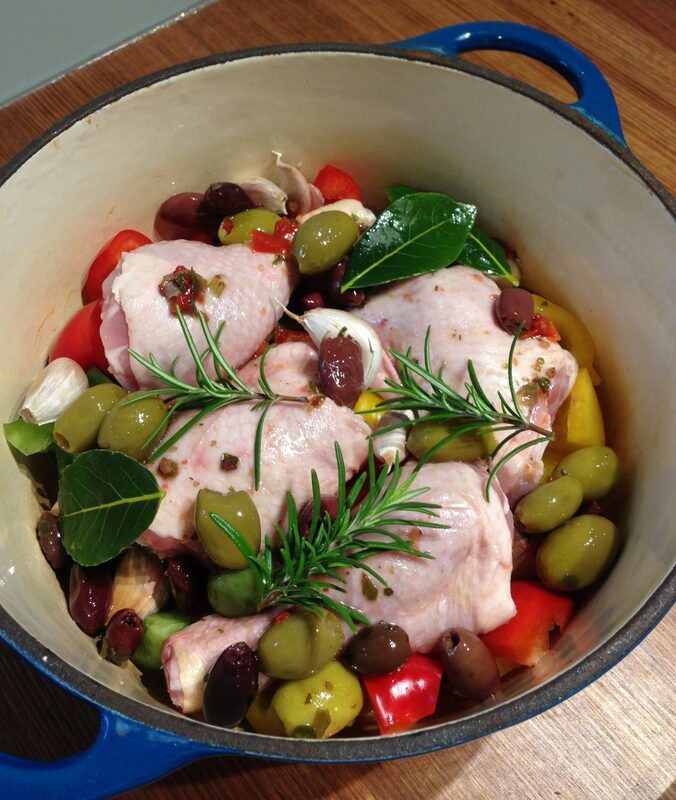 Take off the lid and put back in the oven for another 30 minutes to give the chicken some colour. Serve with sliced ciabatta or sourdough and don’t be afraid to get your fingers messy. Well, its been over a year again and so much has happened. But I’ve finally got a few days off and wanted to share a couple of easy recipes that I have made over the holidays. I volunteered to smoke the Christmas ham this year and I ordered a 5 Kg pickled pork leg from my butcher. When the DB went to pick it up for me, it had somehow grown into an 8.3 Kg leg. That was enough to feed both families and heaps leftover. The ham was in the smoker for about 10 and a half hours and I was a bit worried it would be dry, but it ended up being a wonderful juicy and flavourful (is that a word?) ham. Roughly break or chop the butter into small pieces and rub loosely into the flour. Don’t worry if you can see bits of butter, that is a good thing. Make a well in the flour mixture and pour in most of the cold water. Mix until you have a firm rough dough and add the remaining water if needed. Cover and leave to rest for 20 mins in the fridge. On a lightly floured surface, knead gently until the dough comes together. Roll the dough in one direction only, to make a rectangle. Roll until the dough is three times the width (about 20 cm x 50 cm). Try and keep the edges straight and even. Don’t overwork the butter streaks; you should have a nice marbled effect. Fold the top third down to the centre, then the bottom third up and over that. This will give you square again with three distinct layers. Give the dough a quarter turn (so that the folds are at the top & bottom and (what was the long) end of the pastry is n the left or right. 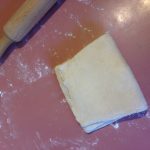 Roll the pastry out again to three times the length. Fold as before, cover and refrigerate another 20 mins before rolling to use. 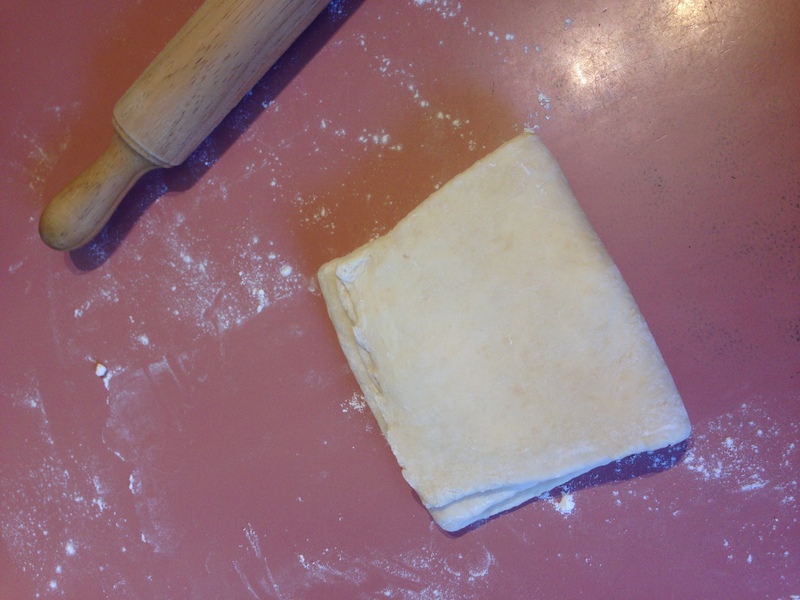 On a floured surface, roll out your pastry to cover your pie tin, with the edges overlapping. You can trim there once the filling is in. Directly onto the pastry in your pie dish, sprinkle the onion, diced ham and peas. Gently whisk the eggs, salt & pepper together with a fork and pour into your pie dish. 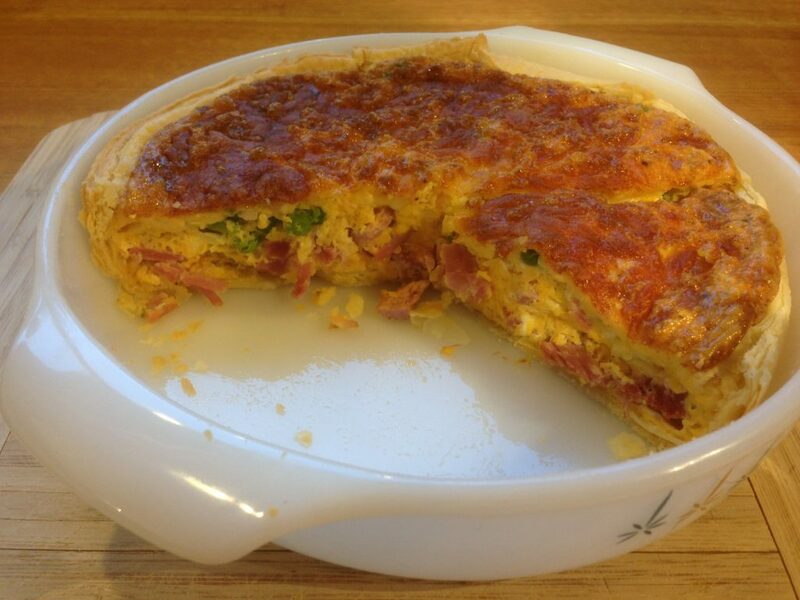 Sprinkle with cheese and bake in the oven for approximately 30 minutes, until the egg is cooked through. Leave to sit for a few minutes before cutting, if serving hot. Otherwise, leave to completely cool and serve cold with a garden salad.